Potato late blight is one of the most devastating plant diseases. The epidemics that destroyed potato crops in Europe in the 1840s led to mass starvation. For example, in the Great Irish Famine of 1845 to 1847, up to one million people died and a similar number of people emigrated to the rest of Europe and the USA. There were, of course, factors that contributed to the starvation, including the land-tenure system in Ireland at that time, and the almost total dependence of the poorer working population on potatoes as their source of food. Nevertheless, potato blight ranks as one of the most devastating diseases in human history. Even today it is one of the major pathogens that chemical companies target in their search for new fungicides. The disease is caused by a fungus-like organism, Phytophthora infestans, which is a specialised pathogen of potato and, to a lesser extent, tomato (another member of the plant family Solanaceae). The fungus is dispersed by wind-borne sporangia, which are produced on branched hyphae (sporangiophores) that emerge from the stomata of infected leaves in humid conditions (see diagram). When the sporangia land on a new leaf surface they usually undergo internal cleavage of the protoplasm to produce motile, uninucleate zoospores, which locate the leaf stomata, where they encyst and germinate to initiate infection.Within the leaf, the hyphae produce haustoria in the individual host cells. So P. infestans grows initially as a biotroph. However, the infected tissues soon die, and the fungus then spreads through the leaf as a necrotroph. When P. infestans sporangia are studied in laboratory conditions, they are found to germinate either by releasing zoospores or by producing a hyphal outgrowth. The type of germination is governed by environmental conditions, especially temperature. As shown in the table below, the sporangia release zoospores at low temperatures (4 - 12 oC) but by hyphal outgrowth at higher temperatures (20 - 27oC). 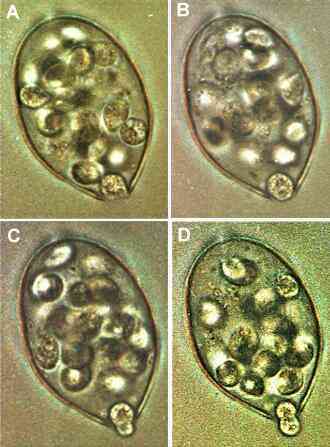 The image below shows two sporangia of P. infestans germinating by hyphal outgrowth at 20oC. The sporangia have a typical lemon-shape, with a papilla at their tip (arrowheads). We see that germination has not occurred from the papilla (a region of thickened wall) but from just around it. At the opposite end of each sporangium we see a short stalk where the sporangium was detached from the supporting hypha. The sequence below shows germination by production of zoospores at 12oC (but for a related fungus, Phytophthora palmivora). 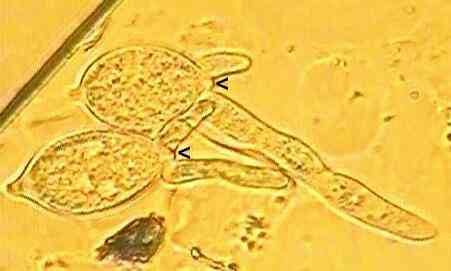 In this type of germination the multinucleate protoplasm of the sporangium undergoes cleavage to form several zoospores, then the papilla is digested enzymatically and the individual zoospores squeeze through the opening. Potato blight has been a problem for over 150 years, and many approaches have been developed to control it. However, in the brief account below we shall see that the search for effective control measures is a continuing challenge - the fungus still poses a major threat, and it has evolved to overcome most of the control measures that were introduced over the years. Control of potato blight traditionally relied on copper-based fungicides such as Bordeaux mixture (consisting of copper sulphate and calcium oxide). However, copper is potentially phytotoxic, so disease forecasting was developed to enable growers to predict when the environmental conditions were highly conducive to spread of the pathogen and thus when the growers needed to spray to protect their crops. Forecasting methods for blight epidemics differ in different countries but in Britain they are based on the "temperature-humidity rule" devised by Beaumont (1947). After a certain date (depending on locality) blight was found to develop within 15-22 days following a period when the temperature was not less than 10oC and the relative humidity was over 75% for 2 consecutive days. Radio stations now broadcast warnings of the Beaumont periods or updated versions of these in the early-morning farming programmes. Copper is a broad-spectrum fungicide which acts as a protectant  it must be applied to prevent disease. It has been superseded by modern systemic fungicides, which move within the plant and can both protect and eradicate existing infections. These fungicides are much more specific in their mode of action. Chief among these for control of potato blight are the acylalanine fungicides such as metalaxyl and furalaxyl. They act specifically on the RNA polymerase of Phytophthora and closely related fungi. However, resistance to them can develop quickly in the pathogen population  it requires only a single gene mutation leading to a minor change in the RNA polymerase molecule. In many parts of the world, P. infestans is now resistant to these fungicides. If P. infestans gets established on the potato foliage then sporangia can be washed down into the soil to infect the tubers, or the tubers can be contaminated with sporangia during crop harvesting. This can lead to rotting of the tubers during storage, and carry-over of inoculum from one season to the next. In order to minimise these problems it is common practice to destroy the foliage (the haulm) with sprays of sulphuric acid or herbicide 2-3 weeks before the tubers are lifted. The cultivated potato (Solanum tuberosum) originates from the Andean region of South America, where there are several other species of the genus Solanum. The potato blight fungus also is thought to have its centre of origin in this region, so it is sensible to seek sources of genetic resistance to the pathogen in the wild potato plants of this region. The species Solanum demissum proved to be an important source of resistance, and by conventional plant breeding (crossing and back-crossing) in the 1940s and 1950s this resistance was bred into commercial potato cultivars. Four major resistant genes (termed R genes) were discovered and were introduced successively into commercial cultivars. However, within a few years of each R gene being introduced widely into potato cultivars, the fungus was found to be able to attack these plants  the resistance was overcome by new strains (termed physiologic races) of the pathogen that developed in response to the selection pressure imposed by the specific R genes. Thus, race 1 of the pathogen could cause disease of potato cultivars carrying the R1 gene, and so on. With four R genes there are a possible 16 combinations  you can breed potatoes with, for example, R1 and R2, or R1 and R4, or R1, R2, R3 and R4, etc. But eventually a pathogen race would emerge that had the corresponding virulence genes to overcome all these. For long-term control, this form of resistance breeding based on a few "major resistance genes" seems destined to fail. So, many plant breeders now prefer to develop cultivars that have "polygenic" or "field resistance" to the pathogen. Such plants have combinations of several "minor" genes, none of which gives absolute resistance, but together they slow the rate of development of the fungus and enable the plant to tolerate infection. Emergence of new pathogenic strains through sexual crossing. Like many members of the Oomycota, P. infestans has two mating types, termed A1 and A2. It can undergo sexual reproduction only if both mating types are present in a population. Both mating types occur in Mexico, near the centre of origin of Solanum and thus presumably of its pathogen P. infestans. However, in Europe only the A1 strain was known to occur - presumably because it was introduced by chance on potatoes imported from elsewhere. Then, in 1978, the A2 mating type was discovered in Britain and is now also found commonly in much of continental Europe. How it arrived or originated here is still unclear, but this has the important consequence that the fungus can now generate genetic variation via recombination. The stage is now set for even more rapid emergence of new pathogenic variants, to overcome our continuing attempts to control this disease. Back to the Fungal Web?